Acclaimed Camarillo Movers is a locally based moving company that has built a strong reputation based on the expertise and consistent innovative efforts by their diligent staff. The full-service moving company is operated by a staff that has been committed to Acclaimed services for years, and together the team at Acclaimed has been compiling their insights and research for the launching of a newly revamped website, acclaimedmovers.com. The website features an expansive blog written by the Acclaimed staff that offers insights into the industry as well as tips and resources, and there are plans to further expand the new site in unique and innovative ways. In addition to maintaining the insightful Acclaimed blog, the company is currently creating an online database of video tutorials. The videos will cover a range of subjects pertaining to moving, from tips on planning specific aspects of moves to insights on the way the moving industry works. The videos are an effort on behalf of Acclaimed to both offer their expert authority to the public at a globally accessible scale and to promote a heightened transparency with moving companies. The moving industry has a past with scam artists using moving as a front, and part of the focus on the new Acclaimed website is to provide customers with insight on how to effectively compare the services and professionalism of different moving companies to effectively identify and avoid scam artists. Acclaimed offers local and long distance moving services with full-service options for packing, as well as specialty moving services like vehicle transports and piano moving. The company's extensive coverage is already reflected in the detail and range of the new website's blog, and the promise of video insights and tutorials is a cornerstone for innovative ways small businesses are utilizing the internet. 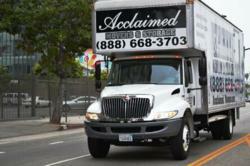 To find out more about the ways Acclaimed Moving and Storage continues to develop, visit http://www.acclaimedmovers.com.